After a week off, Sims Screenshots settles into its new home here at Reel Insight. The previous leaderboard is wiped clean and so is the previous list of 75 films used. There might be prizes involved this time, perhaps whoever dominates the leaderboard after 10 rounds. I'm still thinking on that. It won't be anything extravagant, but maybe a little bit more than bragging rights will be at stake now. 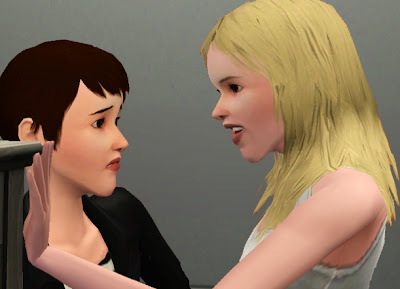 If you're new to this game, I'd suggest you check out this post, the only change is that I did in fact start using my Sims 3 game for this feature. No idea on the image, but I thought I'd ask. Is Sims 3 worth it? I've enjoyed Sims 2 quite a bit, but I haven't played it in awhile because it eventually grew a bit stale for me. Does Sims 3 add enough new features to make the series feel fresh? I think so. In fact, it added so much, that I didn't play it for the longest time because I found it a bit too complicated. I think I owned it for nearly 2 years, before I really got into as a game and that's only because 2 eventually crashed on me. Haha - enjoy it, Monica.